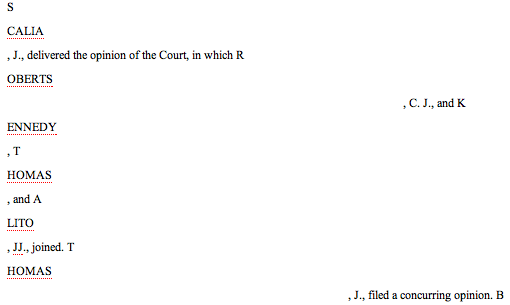 Determine which arguments from the briefs were discussed in the Court opinion. This kind of information -- which arguments attracted the Court's attention and how those arguments were treated -- is valuable to litigators going before the Court and to anyone interested in seeing how the Court arrives at its decisions. It's also the kind of project that should lend itself well to computerized analysis. While this exercise can certainly be done by brute force, by reading each brief and comparing it to the final Court decision, it should also be possible to use software to compare the text and sections of each brief with the final opinion. You can imagine a number of ways of doing this: compare documents at the individual word level, compare section titles, compare case references, etc. However, as soon as you set about to write a program to make these comparisons, you are confronted with a problem: the documents that are available from the Court website, or the American Bar Association (where the briefs are found), are all in Adobe pdf format. Not so bad, you think. These were originally electronic documents, not scanned images, so they were encoded in pdf with their text. Just extract the text and work from there. It turns out not to be that easy. When you scratch beneath the surface of a pdf, you see that it is mainly a graphic representation of the document. A great deal of the structure of the document is simply not encoded: sections, citations, paragraphs -- even the difference between footnotes and the main text -- are all gone. So, for now, we have the technical challenge of converting pdfs to structured text, which is tough enough. Google Documents misses many of the most important text features and in another post, I will discuss other (imperfect) options to do pdf to text conversions, including the pdftotext and pdftohtml programs, and the open source Apache pdfBox and Tika projects. But for a lawyer, or anyone who cares about the "official" or binding version of the court opinion, the problem goes beyond the encoding of the pdf opinion that the court publishes on its website. 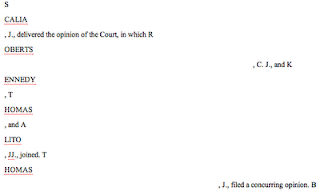 As the Court website explains, there are six different versions of opinions published by the Court. Prior to the issuance of (1) bound volumes of the U.S. Reports, the Court's official decisions appear in three temporary printed forms: (2) bench opinions (which are transmitted electronically to subscribers over the Court's Project Hermes service); (3) slip opinions (which are posted on this website); and (4) preliminary prints. In addition to these four forms, Court opinions are published (5) in pdf on the website and (6) in bound, printed volumes by a commercial publisher under contract with the Government printing office. So which one is the "official" version? The print versions: "Only the bound volumes of the United States Reports contain the final, official text of the opinions of the Supreme Court of the United States. In case of discrepancies between the bound volume and any other version of a case--whether print or electronic, official or unofficial--the bound volume controls." A variation on this policy can be found on the U.S. House website, describing the publication of Federal legislation, whose "official" version is the one printed by the Government Printing Office once each year. Considering that nearly all legal research is now done electronically, there is a serious disconnect here between actual practice and the policies of these two branches of Government. So, not only do the electronic versions of legal sources from the Court and Congress lose or scramble much of the original structural information, their official policies undermine the value of publishing in electronic form to begin with. In practice, what this means is that attorneys, and even the Court, ends up relying on one of the two major commercial databases, Westlaw and Lexis/Nexis for the electronic versions that they publish, after those companies input their own version of the documents' structure. As a result, the Court ends up subscribing to these commercial databases to get access back to its own original sources. What an odd state of affairs. The solution, technically simple, will take some political will, or some technical enlightenment from the Court: publish Court opinions in an official electronic format that includes important structural information. This could be as simple as publishing the document in a "tagged" pdf format, or even better, to move toward a more "native" electronic format such as XML. The Executive Branch has done with the Federal Register (a report of all official government updates) and the Code of Federal Regulations, which are now both published in XML. The recent letter from House Speaker Boehner and Majority Leader Cantor urging the House to publish legislation in XML moves things closer in that branch, as well. Any bets on how long it will take until all three branches are publishing in a native electronic format?